Teh project is originated from the CleverHealth Network, an ecosystem coordinated by the Hospital District of Helsinki and Uusimaa (HUS). The main partners in the gestational diabetes project are HUS, Aalto University, the University of Helsinki, Elisa and Fujitsu. ‘By improving lifestyle during pregnancy, we can probably reduce the number of mothers who will develop type 2 diabetes as well as the health risks to the child, thereby also improving the health of future generations. The application will help the patient to learn how her diet, activity and sleep affect blood glucose levels and weight gain and, consequently, the course of the pregnancy and the newborn’s health,’ says Saila Koivusalo, research director of the project and specialist in obstetrics and gynaecology. 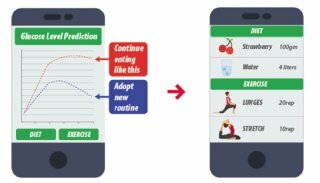 The application will forward the lifestyle and glucose data in real time to health care personnel, who can provide guidance and support as needed. The project will make use of machine learning to provide guidance and treatment that are in line with the patient’s risk profile and meet her individual needs. Artificial intelligence also makes it possible to draw up predictions of both the mother’s and the child’s future health.